Antique 19th Century crystal candleholder centrepiece bases, converted to table lamps. Brand new wiring. Antique crystal candleholder centrepiece base, converted to a table lamp. Brand new wiring. Early 19th century canton Chinese export porcelain rose medallion chamber pot with lid. Measures: Height with lid: 16 cm Height without lid: 10 cm. This pair, have been mounted as lamps. They are covered from top to bottom with brightly colored flowers and vines against a black ground. 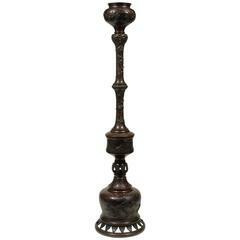 Raised on Chinese style carved wood bases. 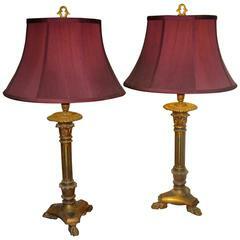 Pair of French 19th century bronze candlesticks converted into table lamps with new shades. 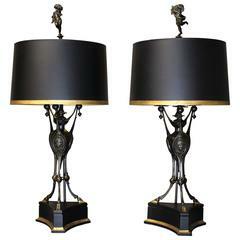 Pair of 19th century neoclassical bronze candelabras converted to lamps. 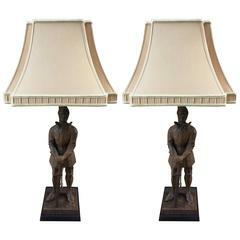 Pair of cast iron 19th century knights converted to lamps. 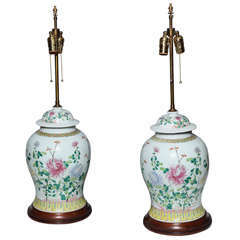 Pair of 19th century Chinese porcelain Ginger Jars converted into table lamps with wood bases. The pair is beautifully painted with delicate images of flowers and green leaves.